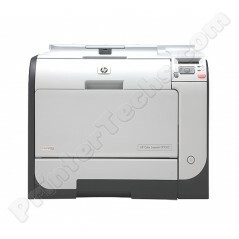 The refurbished HP Color LaserJet CP2025dn is a compact office-class color laser printer. Print speeds up to 21 pages per minute. Includes a 250-sheet input tray, Ehternet & USB port, and a built-in duplexer for two-sided printing. This printer would be ideal for light duty office printing. 15.9 " x 19.1 " x 12.7"